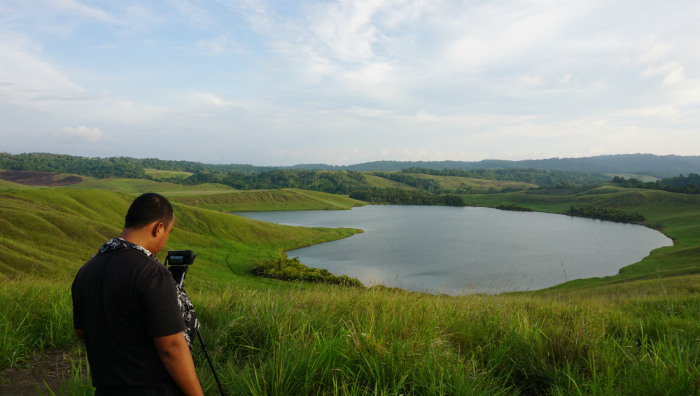 I’ve always been a big fan of nature and culture, so when I had the chance to visit Sentani I was never going to refuse (feel free to check out my article about Sentani Lake Festival). The Sentani airport (the airport that also serves Jayapura, the capital of Papua province) is located super close to Sentani lake. Oh… Please note, if you’re going to be flying into Jayapura make sure to get a window seat. 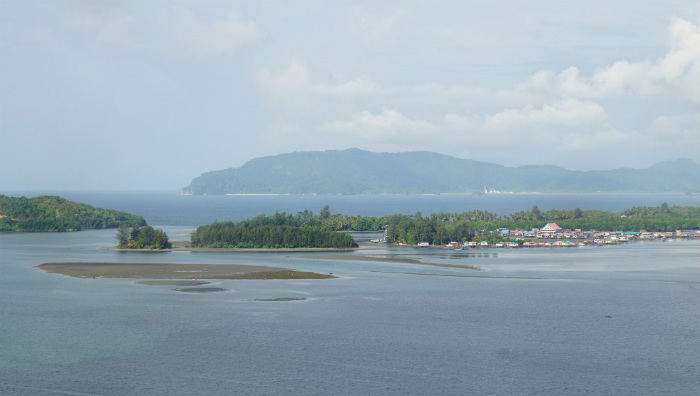 The view as you come in to land or leave Jayapura is not to be missed. 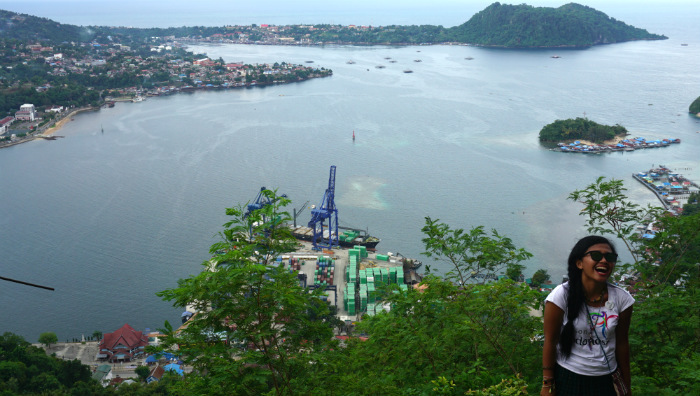 Jayapura is located on the coast, in a bay. The land behind the city rises sharply. The streets wind up and down the hill of Sentani and Jayapura. In fact, the hill rises a bit too sharply. Every time I got in the car I felt a bit carsick. Luckily the beautiful landscape helped to distract me from my motion sickness. 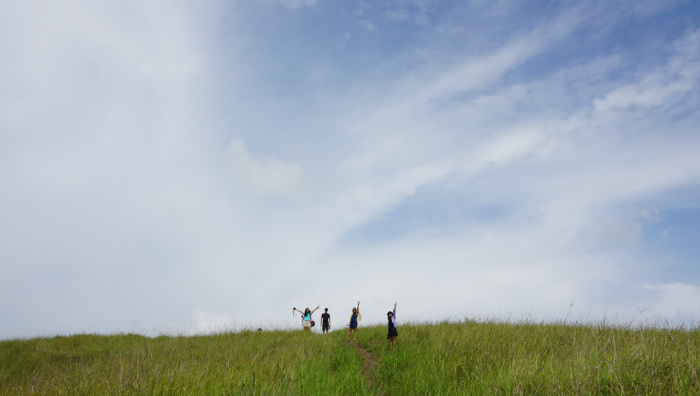 Here I would like to share some places that you should consider visiting when you get a chance to come to Sentani and Jayapura (especially if you are a nature lover like me). I’m talking about green hills, blue sky and trees. 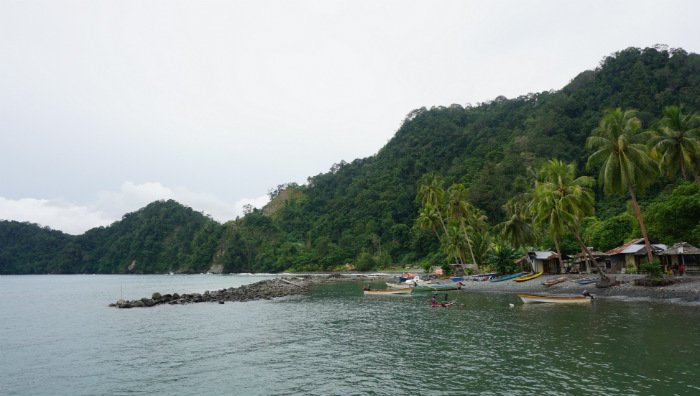 Our super friendly guide, Andre from PaTGom (Papua Tour Guides Community) said that Youtefa means a cove inside a bay. The bay reminded me of Natsepa beach in Ambon. It is not just about the view, but also the people who visit. 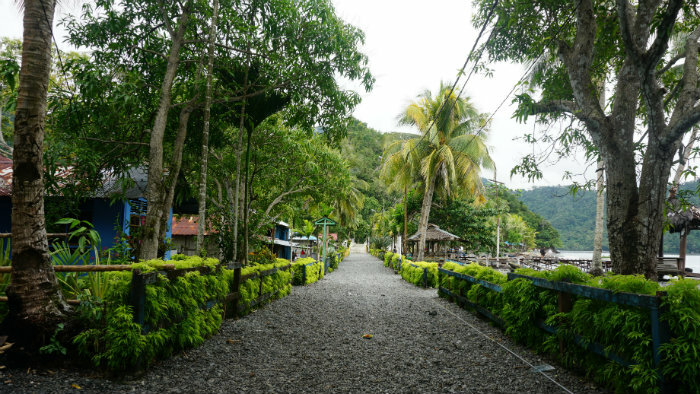 In Natsepa there are lots of locals and tourists who visit the place to enjoy the beautiful view and eat the famous Natsepa rujak (it is like fruits salad with sauce). At Youtefa bay view point you can also find plenty of locals and tourists who visit the area to enjoy the panoramic views and drink from coconuts. Unfortunately, Youtefa Bay does have some problems. Andre told us that the destruction of mangrove forests around Youtefa bay and the problems with garbage. Given the fact that the area is so beautiful, I hope that the local people and the local government will find the right way to manage the area. 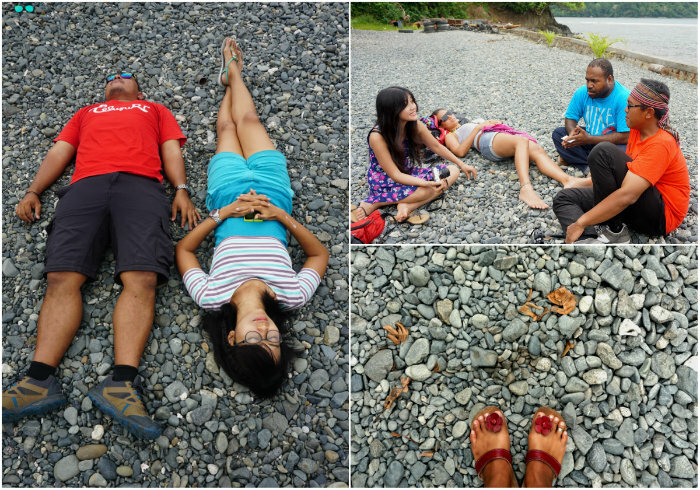 Speaking of things to see around Sentani, a visit to Telaga Emfote or Emfote lake is a must. It is a 2 hours journey from Sentani Kota and close to and part of Abar village. It’s hidden away and although you can actually get there by car, few people visit. In fact, one car in our group actually got lost when trying to find the lake. (Feel free to read the stories written by Fiona here – and Wira here). Emfote lake is shaped like a heart. 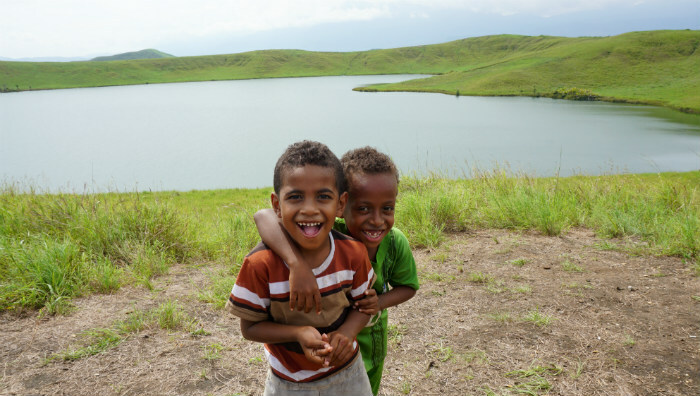 Andre told me that the lake is inhabited by species native to Papua; like Sentani gudgeon (oxyeleotris heterodon), Sentani rainbowfish (chilatherina sentaniensis) which critically endangered species, and the Red rainbowfish or salmon-red rainbowfish (glossolepis incisus). The lake is even inhabited by shark-saws / largetooth sawfish – pristis microdon (you can Google it if you haven’t heard of them before). It is really quite amazing and the environment surrounding the lake is really pristine. There are several view points around the lake. The best place to get a good view is at the highest point. From here you can really see how the lake shaped like a heart. Not far from the lake there are some funny looking hills. We named the hills pudding and Hershey hill. Yes, from Hershey chocolate, but I’m pretty sure it has another name! Jayapura city looks busy yet beautiful from the hilltop transmitter Polimak 1. A “Hollywood” sign kind of hill, but here they wrote “Jayapura City.” In addition to enjoying the scenery and taking photos under/near the words “Jayapura City,” you can also explore. 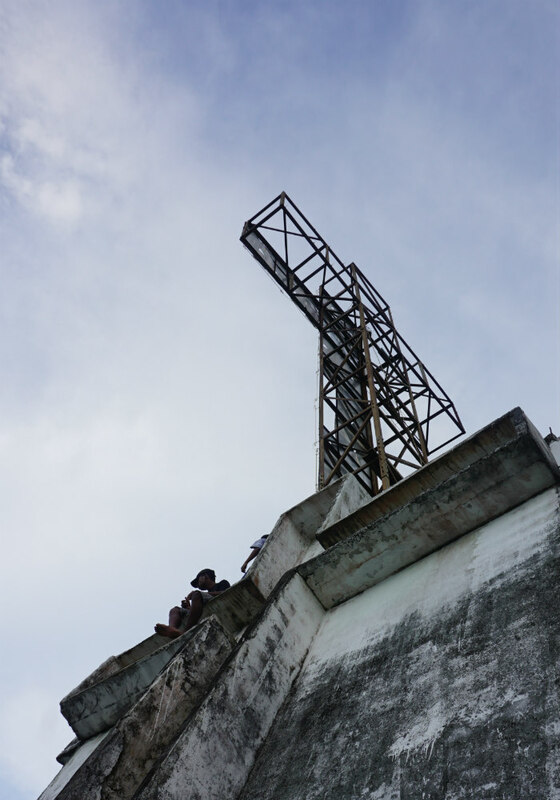 If you walk to the left and you can see a cross at the top of the hill (they call it the Cross monument / Tugu Salib). When we visited there were a few local lads who had climbed up onto the top of it. I do not know how they did it. It was super high and looked very scary. I told you that the city of Jayapura is hilly, right? Bukit Ifar Gunung or Ifar Gunung is located inside the military area. The best time to visit is on the weekend. The MacArthur monument welcomed us when we reached the area of Mount Ifar. There was also a museum about General MacArthur and the role he played during World War II. When we visited we walked into a crowd of people who were enjoying the view from the top of the hill. 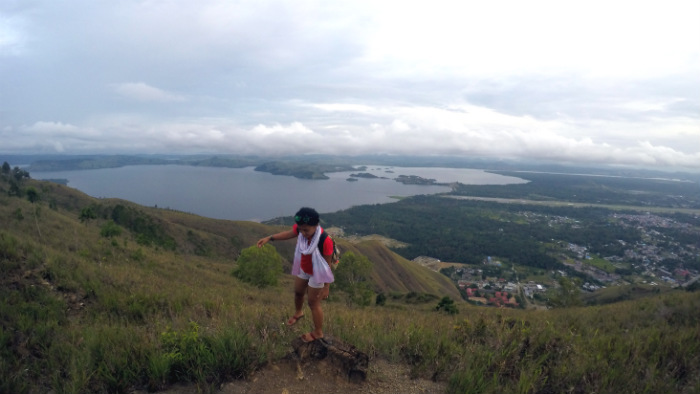 We could clearly see the Sentani airport strip from here. 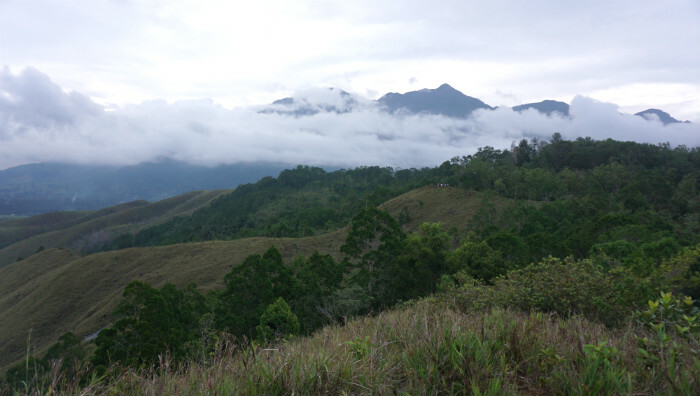 If you walk to the far side you get a great view of Sentani Lake and the Cyclops mountain shrouded in mist. 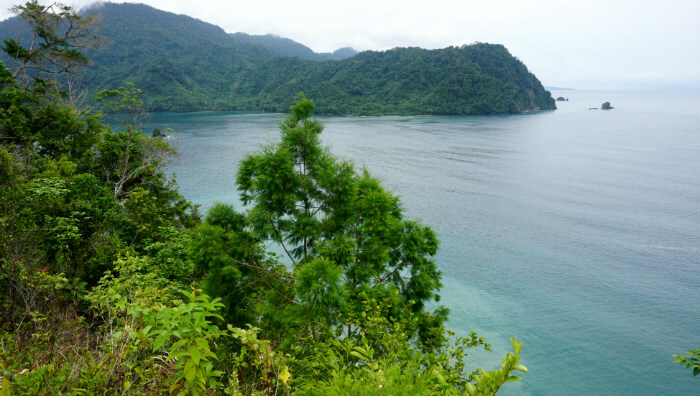 Tablanusu beach in Tablanusu tourism village, Depapre district is located in Tanamera bay, Jayapura. The unique thing about this village is it is covered with small rocks. I found it hard to walk on at first. It is said that if local residents walk on the rocks you will not hear a sound.. But it is not true though. The local people I saw were walking pretty noisily. The beach is also busy with local children who you will probably see sailing in traditional local boats (for fishing) called Eikuttu. The vessels are really narrow and I do not understand how you can sit on them comfortably and balance in the boat (btw, I got a miniature model of an Eikuttu boat from Heri, one of our guides, as my birthday present. I super love it!). 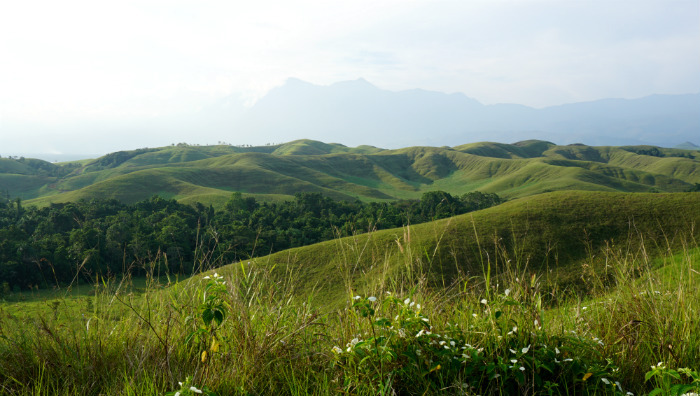 Actually besides all those places above, there are a lot of nice areas around Sentani and Jayapura that you can visit. You know the kind of places that make you say “Woooww! !” followed by “please can you stop the car for a while?“. Places like I captured in these photos below. Are you a big fan of nature? 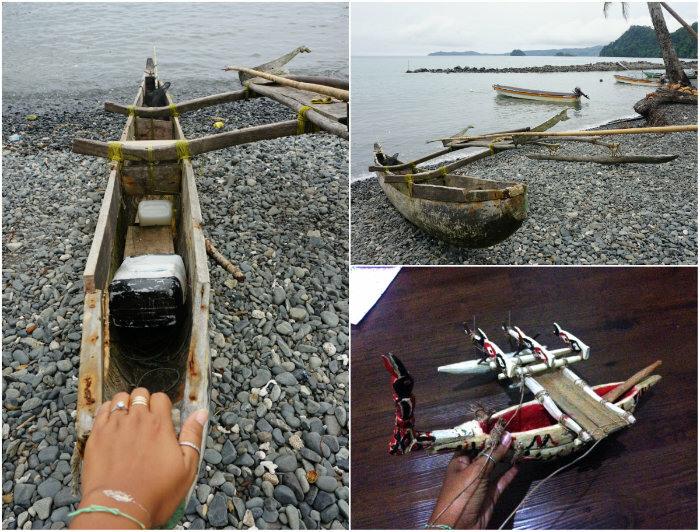 Have you visited Jayapura? Where would you recommend visiting? PS: Some pictures were taken by Wira Nurmansyah, Tekno Bolang and Fiona Callaghan. Thank you guys! If you are interested in booking accommodation for your holiday in Papua Province I recommend Airbnb. Book through this link to receive a special $25 discount. For hotel bookings I recommend Agoda for its low price and discounts. Jayapura memang tak diragukan lagi keindahannya. Tidak hanya Danau Sentani yang tersohor itu, ternyata banyak destinasi-destinasi daerah sana yang jauh lebih indah terutama danau Cinta yang dikelilingi savana yang hijau. Indeed, Clara. Thanks for dropping by. Terima kasih, Walter Pinem. Iya jauh banget Papua hahaha.. 5 jam terbang masih di Indonesia juga. Tapi kayanya spot-spot cantik di Indonesia ada di mana aja deh. 🙂 Misalnya: Bromo, walaupun sudah 3 kali ke sana, masih mau lagi!